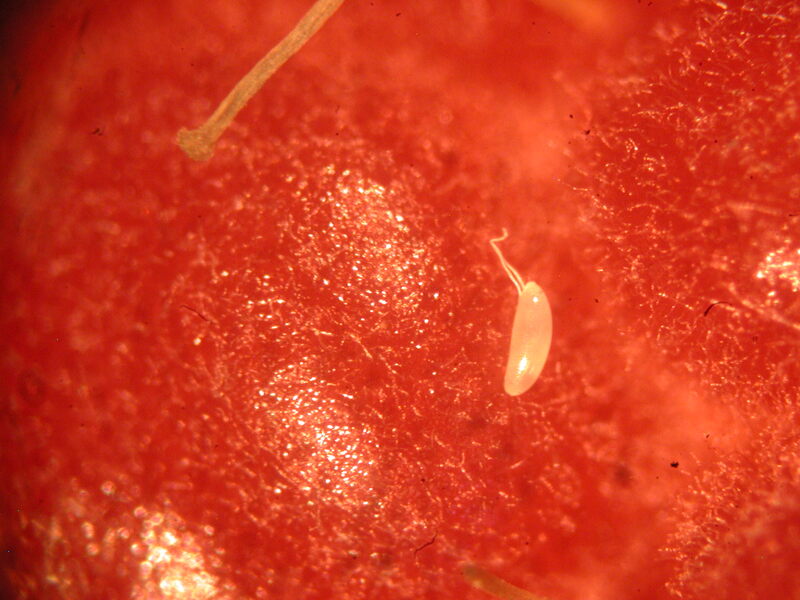 Spotted Wing Drosophila (SWD) Update: July 30th. 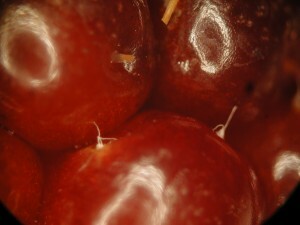 SWD Fruit Injury in Ulster County. 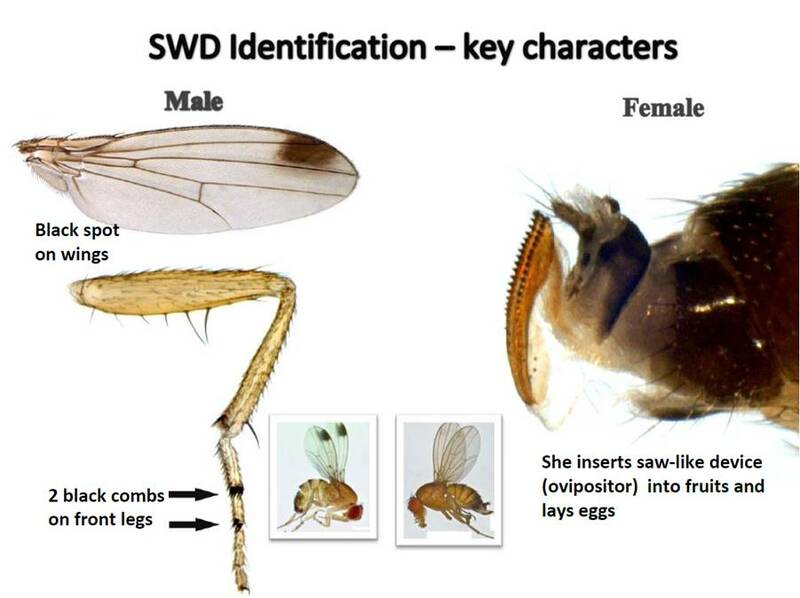 We have been capturing spotted wing Drosophila (SWD) in Ulster County since mid-July. 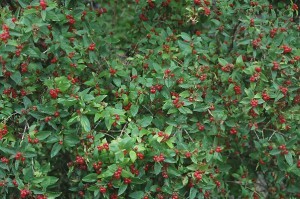 The primary edge host of the SWD in the lower Hudson Valley appears to be the Tartarian Honeysuckle, Lonicera tartarica. Berries from this host are quite numerous and very attractive to the fly. 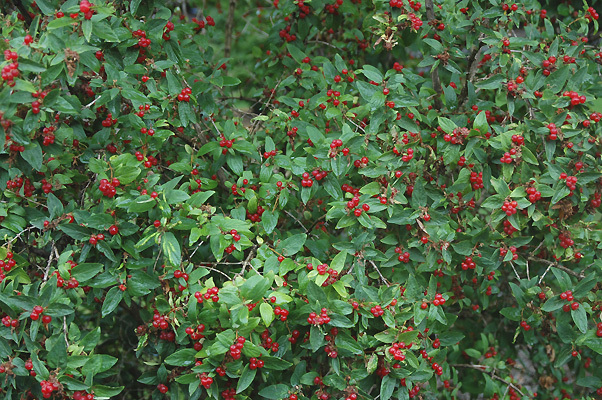 The female will lay large numbers of eggs in these small red berries to develop high populations prior to migration into cultivated crops. We have yet to rear SWD from honeysuckle this season but larva are developing rapidly in this host and by the weeks end we will likely see a second generation emerge from these berries. To date we have only seen a single cultivated blueberry injured by SWD. We have not yet seen fruit damage in summer / fall raspberry plantings. Recent trap captures show two male and two female using a yeast/flour/sugar baited apple cider vinegar trap in a raspberry patch at the Hudson Research Valley Laboratory, Ulster County, NY, collected on July 27th. We’ve observed raspberry and blackberry to be a favored host of the SWD, relative to blueberry and strawberry, requiring more intensive management strategies. In raspberry or blackberry patches where SWD have been captured and or fruit injury has been observed, management should begin at the first available application window to reduce adult populations and egg laying. In these cultivars a tight management schedule of 3-4 days may be needed if populations continue to increase. Rotating plots within a block may be needed to maintain daily harvesting while cleaning the brambles of all fruit to reset management and eliminate eggs and larva in fruit may be an important part of late season management. 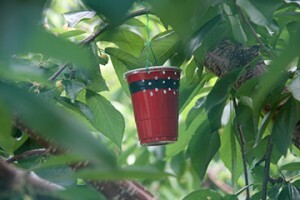 Removal and complete destruction of infested berries will also reduce newly developing populations to aid in management. Keeping fruit cold (34-38F) directly after harvest will arrest egg and larval development. Prolonged exposure to these low temperatures for 4d will dramatically reduce egg and larva survival. To date, SWD have been captured in the Hudson Valley counties of Westcester, Dutchess and Ulster in raspberry, blueberry and blackberry plantings. Given the increasing number of SWD finds we are seeing in the northeast, it would be wise to begin trapping efforts in brambles and blueberry fields as flies increase from localized to regional populations. Although very little damage has occurred in Hudson Valley fruit, it’s likely that SWD damage to small fruit will begin over the upcoming week as adults establish and build in populations in berry patches. 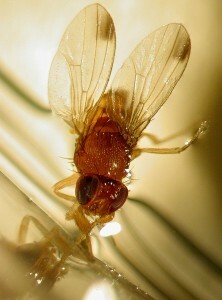 Spotted Wing Drosophila, Drosophila suzukii (SWD) is a vinegar fly native to East Asia. Established in the Eastern US since 2012, it has become an invasive insect pest of small fruit and to a lesser degree, cherry and grape. Information on insect biology. Traps we are presently using are made of clear plastic 18 oz. deli cups and lids. Traps are baited with apple cider vinegar (ACV), as the attractant killing solution. Approximately 30, 1/8″ holes, are drilled around the top 3/4 of the cup, leaving a 3′ gap to pour out the ACV solution in a strip of 2″ x 2″ netting to access the number of captured flies. A yeast, flour & sugar bait mixed with water is added to a 5 oz. fixed position cup along the top edge. The Cornell Spotted Wing Drosophila web site hosts a map of the counties in which SWD is being trapped. Updates on presence based on trap findings can be found here.